La Jolla Playhouse's recently announced 2006-07 season offers diverse theatrical experiences, including two world premieres, a classic parable, vaudeville, a musical revival and a new Page to Stage workshop production. The theater kicks off the season with "Zhivago," developed last year at the Playhouse as a Page to Stage workshop production. After several months of additional work, La Jolla Playhouse will present a fully realized production that will include new scenes, songs and music. The musical -- with book by Michael Weller, music by Lucy Simon and lyrics by Michael Korie and Amy Powers -- is based on the famous 1958 Nobel Prize-winning novel by Russian author Boris Pasternak. Set amid the Russian Revolution, the story of forbidden love follows a surgeon-poet and his muse Lara. "I am thrilled to open the season with the world premiere of 'Zhivago,'" said Playhouse artistic director Des McAnuff. "This is a banner year for us -- it marks the first project developed through the Page To Stage program to go directly to a full production on La Jolla Playhouse's main stage." "Zhivago" opens May 9 and runs through June 25. Lisa Peterson ("Be Aggressive," "The Country") returns to the Playhouse to direct Bertolt Brecht's legendary theatrical parable, "Mother Courage." The modern classic is a "rumination on war and humanity," and "speaks to many of the discussions pertinent to American society today," said McAnuff. As a mother profits from the spoils of war, she also must make the ultimate sacrifice. Mother Courage struggles to keep her family alive as she trails the troops and sells the very provisions that perpetuate war. One of the 20th century's most profound works dazzles with music, burlesque, pathos and irony. "Mother Courage" runs June 20 through July 23. The off-Broadway hit "all wear bowlers" opens Aug. 1 and runs through Sept. 3. 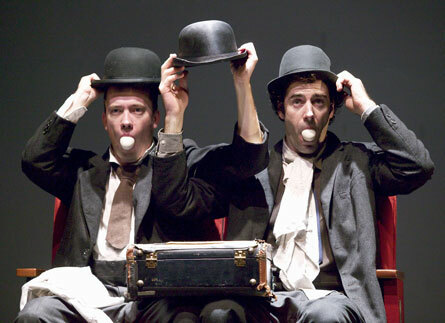 Physical comedians Trey Lyford and Geoff Sobelle wrote and star in this high-energy escapade of slapstick, pratfalls and sleight of hand. Lyford and Sobelle are two Laurel-and-Hardy-type silent-film clowns who magically become the stars of their own stage show. The Playhouse also brings in one of the country's leading Latino/Chicano theater troupes for "Culture Clash's Zorro In Hell," a swashbuckling and hilarious adventure. El Zorro rode out of the pages of pulp fiction, tumbled into Tinseltown's image machine and transcended the barriers of class, race and ethnicity to become a hero for the oppressed in every land. Culture Clash, the country's leading Latino theater troupe, unmasks the legend of Zorro -- from Douglas Fairbanks to Antonio Banderas -- with their irreverent, incisive and zany brand of mayhem and humor. "Culture Clash is a group born of the past, commenting on the present, and advising us on the future. Their work is social commentary with a comic spice no one can match," McAnuff said. "Culture Clash's Zorro In Hell" plays Sept. 30 to Oct. 29. Also starting in September (exact dates to be announced), the Mandell Weiss Theatre will be transformed into an urban dreamscape for a revival of the award-winning musical "The Wiz." Based on L. Frank Baum's "The Wonderful Wizard Of Oz" and featuring the same familiar story, McAnuff teams up with original "Wiz" orchestrator Harold Wheeler to create a reimagined, multicultural musical event. "Our production will reflect the shifts that have occurred in the dominant pop culture, in both music and theater, since The Wiz's history-making Broadway debut in the 1970s," McAnuff said. "This is modern Oz, with a modern look and modern sounds." The season also will include a Page to Stage workshop production of "The Farnsworth Invention." McAnuff collaborates with "The West Wing" creator and writer Aaron Sorkin to shape his new play about the advent of television. In 1920, a young Idaho farmer named Philo dreams of a device that projects images transmitted through the air. Meanwhile, across the country a Russian immigrant named David, who has clawed his way out of the shtetl to become a media mogul, dreams of spreading information to the masses using pictures. In a race that would change humanity forever, two men battle one another for honor, glory and a place in the history books. The play centers around the bitter conflict that pitted Farnsworth, a boy genius who invented television as a high school student in 1927, against inventor Vladimir Zworykin, a Russian immigrant who patented a similar device in 1923, and Zworykin's chief financial sponsor David Sarnoff, the head of the Radio Corporation of America (RCA). The legal battle between Farnsworth and RCA would later become known as one of the great, tragic examples of legal and industrial force combining to crush a rightful patent owner. Presented in collaboration with Ireland's Abbey Theatre, this story will take shape through the Page to Stage New Play Development Program, La Jolla Playhouse's signature program in which audiences experience the "birth" of a play, taking part in its shaping as playwright and director make constant changes in response to audience reactions and feedback. Dates for "The Farnsworth Invention" have yet to be announced. Subscriptions for the season are now on sale, and range from $96 to $440. Single tickets will go on sale in late spring, and will range from $28 to $72. For more information visit www.lajollaplayhouse.com or call (858) 550-1010.